As expected, Marvel Studios first Phase Three movie Captain America: Civil War had no trouble repeating atop the box office heap this weekend, earning $72.5 million in its second weekend, for an easy win over newcomers Money Monster and The Darkness. This weekend's tally also helped Marvel reach a coveted box office milestone, as it crossed $10 billion worldwide. The MCU is the first franchise ever to cross this mark, and there are no signs of the studio slowing down anytime soon. Captain America: Civil War is the 13th movie in the Marvel Cinematic Universe, and the first in its massive Phase 3 lineup, which will feature 10 movies in total. Back in 2014, the MCU became the biggest movie franchise in cinematic history, surpassing Warner Bros. Harry Potter franchise which earned $2.39 billion domestically ($7.7 billion worldwide) throughout its eight-movie run. Domestically, the MCU has earned $3.8 billion, and while the Harry Potter franchise will continue with Fantastic Beats and Where to Find Them later this year, which launches a new trilogy, there's essentially no way that this franchise could conceivably catch up with the MCU's $10 billion tally, reported by Box Office Mojo. The only franchise that may be able to catch up with the MCU at this point is Star Wars, coming off the record-breaking grosses for Star Wars: The Force Awakens. The blockbuster shattered the all time domestic box office record with $936.4 million domestically and $2.06 billion worldwide. The franchise as a whole has taken in $3.1 billion domestically and $6.7 billion worldwide, which also includes re-releases of the original and prequel trilogies. We recently reported that Disney has plans to release a new Star Wars movie every year, indefinitely, but, at the same time, it's worth noting that the MCU releases at least two movies a year, and they will start putting out three movies a year over the next few years. After Captain America: Civil War closes out its run, Phase Three will continue with Doctor Strange, which hits theaters on November 4. Next year, the MCU will debut Guardians of the Galxy 2 (May 5, 2017), Spider-Man: Homecoming (July 7, 2017) and Thor: Ragnarok (November 3, 2017), followed by Black Panther (February 16, 2018) ,Avengers: Infinity War Part 1 (May 4, 2018), Ant-Man and the Wasp (July 6, 2018), Captain Marvel (March 8, 2019) and Avengers: Infinity War Part 2 (May 3, 2019). The studio has also set three Marvel movies for release on May 1, July 10, and November 6 in 2020, which will kick off Phase 4. As for Captain America: Civil War, it should cross the $1 billion mark later this week, and it's possible it could dethrone The Avengers as the biggest MCU movie worldwide, breaking its $1.5 billion mark set in 2012. 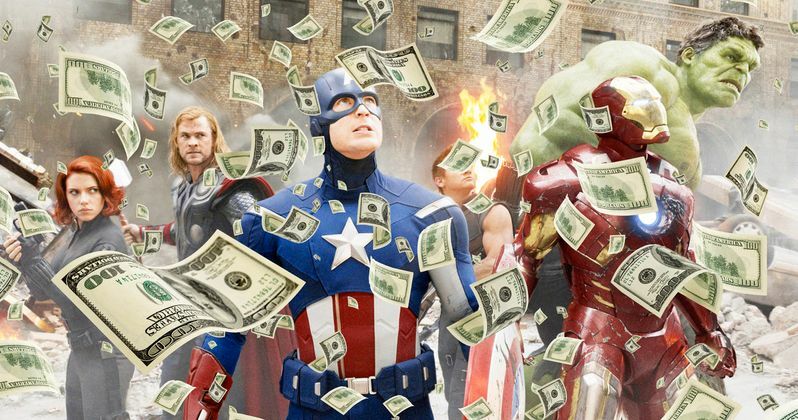 However, it still has plenty of work to do to catch up with The Avengers' massive domestic tally of $623.3 million. Be sure to stay tuned for more on the MCU's record-breaking box office run as we get ready for the rest of the studio's Phase 3 lineup.